Intermittent fasting dietary restriction (IF-DR) is recently reported to be an effective intervention to retard age associated disease load and to promote healthy aging. Since sustaining long term caloric restriction regimen is not practically feasible in humans, so use of alternate approach such as late onset short term IF-DR regimen which is reported to trigger similar biological pathways is gaining scientific interest. The current study was designed to investigate the effect of IF-DR regimen implemented for 12 weeks in middle age rats on their motor coordination skills and protein and DNA damage in different brain regions. Further, the effect of IF-DR regimen was also studied on expression of energy regulators, cell survival pathways and synaptic plasticity marker proteins. Our data demonstrate that there was an improvement in motor coordination and learning response with decline in protein oxidative damage and recovery in expression of energy regulating neuropeptides. We further observed significant downregulation in nuclear factor kappa B (NF-κB) and cytochrome c (Cyt c) levels and moderate upregulation of mortalin and synaptophysin expression. 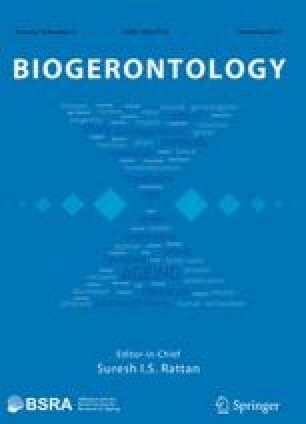 The present data may provide an insight on how a modest level of short term IF-DR, imposed in middle age, can slow down or prevent the age-associated impairment of brain functions and promote healthy aging by involving multiple regulatory pathways aimed at maintaining energy homeostasis. Rumani Singh, Shaffi Manchanda and Taranjeet Kaur have equal contribution. The current research work was funded by the Indian Council of Medical Research (ICMR) under the National Task Force Project—an initiative on aging research. Rumani Singh is thankful to ICMR and Taranjeet Kaur and Shaffi Manchanda are thankful to UGC for the research fellowship grant during the entire course of study. Infrastructure provided by University Grants Commission (UGC), India under UPE and CPEPA schemes and Department of Biotechnology (DBT), India under DISC facility is highly acknowledged.